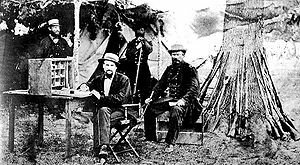 This photo was taken at 6th U.S. Cavalry Headquarters circa 1862. From right to left: standing; unknown; Major Laurence A. Williams. Sitting; 2nd Lieutenant Samuel M. Whitside; Captain William P. Sanders. I found this photo on a Wikipedia search for Samuel Marmaduke Whitside, although I believe the original is housed at the Fort Huachuca, Arizona Museum. Jim Jones and I have been trying to figure out who our mystery man is in the above photo, and decided to post this in hopes that a reader may see or know something that we do not. From the regimental records, we know that the regiment took to the field on 10 March 1862. 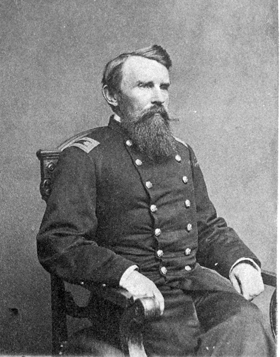 Additionally, Major Williams left the regiment on 26 June 1862. Therefore, the photo must have been taken between 10 March and 26 June 1862. Additional thoughts: At the time of the photo, Williams and Sanders are the two senior officers assigned to the regiment. It could be a regimental headquarters photo (the three named are from different companies, eliminating that possibility). Whitside filled in at times as an acting adjutant. If we make this assumption, the most likely candidates are Spangler as the RQM or the regimental sergeant major at the time. Given the appearance of the epaulets in the photo, however, it’s most likely an officer.